Truth be told, when it comes to John Hanson and Rob Nilsson’s Northern Lights, that quote might not be entirely accurate, as the co-directors’ determined efforts to self-distribute their film upon its completion in 1978 resulted in a modest regional success. And when it took home the Camera d’Or (aka, Best First Feature) at the Cannes Film Festival in 1979, it received a much bigger boost. So how then, as someone who studied film history in college and who considers American independent cinema to be his hobby, his job, and his primary adult obsession, am I only just now discovering Northern Lights for the first time? Whether this theatrical restoration introduces or re-introduces you to Hanson and Nilsson’s landmark American independent drama, the fact remains that it is a cause for celebration. 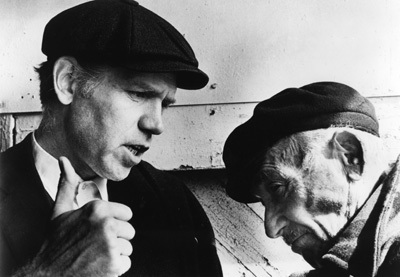 Shot in 1978 but set predominantly in the early 1900s, Northern Lights uses a faux-documentary framing device: in the present day, 94-year-old Henry Martinson sits down at a typewriter to tell the story of the Nonpartisan League, of which he played a major role (the reality is that Martinson was an active participant in this rarely recognized chapter of American history). The League was a Socialist group of North Dakota farmers who were fed up with being bullied by the bankers and suppliers and decided to take a stand by voting themselves into positions of governmental power. Flashing back to the past, Martinson tells the story of Ray Sorensen (Robert Behling), his lifelong love Inga Olsness (Susan Lynch), and their surrounding community. Though this all might sound quaint and old-timey, the issues presented are surprisingly current. To describe Northern Lights as “John Cassavetes’ Days of Heaven” might sound crass, especially since those names are tossed off to the point of numbness these days, but that is indeed how this modestly budgeted production plays. Shooting in grainy black-and-white 16mm, the filmmakers alternate between extreme close-ups of hardscrabble faces and wide, expansive natural vistas, capturing the oppressive, claustrophobic feeling of those early 20th century North Dakota winters. Recently, thanks to the great Milestone Films, we’ve been blessed with restorations of landmark American independent dramas like Charles Burnett’s Killer of Sheep, Kent Mackenzie’s The Exiles, and Shirley Clarke’s The Connection. Now, thanks to Artists Public Domain’s Cinema Conservancy, Northern Lights can be added to the list. Don’t miss your chance to see the restoration of this very special film.